We are the world's experts. Dr. Levitan was in the first class of EM residents at Bellevue Hospital (1990-1994), and subsequently worked in academic, high-volume, inner-city trauma hospitals in NYC and Philadelphia for 25 years (Bellevue, Lincoln, Penn, Einstein, Jefferson). Starting in 2012 he began working in rural, critical care access hospitals. He now balances this clinical activity with teaching courses, speaking engagements, and device development. In addition to the Airway Cam, his inventions include the Levitan FPS optical stylet, the Cric Key™ and Cric Knife™. He has published extensively on laryngoscopy and airway management and holds an Adjunct Professor appointment at Dartmouth (Geisel) School of Medicine, as well as a Visiting Professor appointment at the University of Maryland School of Medicine. The Airway Cam imaging system was invented by Dr. Levitan in 1994 when he was an emergency medicine resident at Bellevue Hospital in NYC. 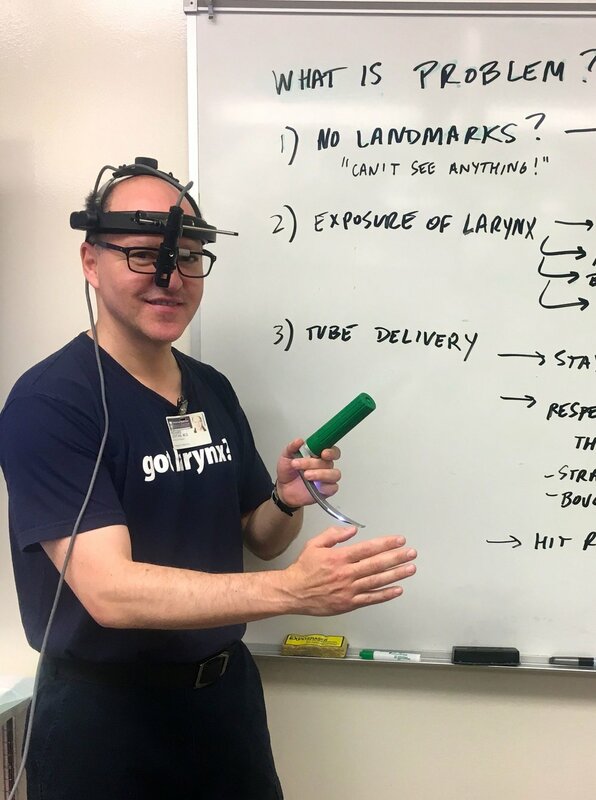 Recognizing the challenges of skill acquisition and the lack of imaging, he developed a means of displaying direct laryngoscopy as seen by the operator. The Airway Cam is a head mounted video camera, optically aligned with the dominant pupil, that is able to image direct laryngoscopy from start to finish; it was patented in 1998. Dr. Levitan has been involved with airway education and research since 1994, using the Airway Cam to record procedures in live patients and cadavers. He started cadaver-based emergency airway management courses beginning in 2001 with Dr. William J. Levin. Now run with Dr. Kenneth Butler, James T. Pisaturo EMT-P, and Dr. Jorge Cabrera, these on-going cadaver courses are offered monthly in Baltimore. The success of the Baltimore course has led to Dr. Levitan’s involvement with cadaver courses now offered in Australia, the UK, and New Zealand. Research conducted using the Airway Cam has demonstrated a best practice approach to laryngoscopy including: ear-to-sternal notch positioning, bimanual laryngoscopy, and straight-to-cuff stylet shaping. Airway Cam educational materials–videos, book, and pocket guide–have been critically acclaimed by leading medical journals around the world. The Levitan FPS Optical Stylet merges direct laryngoscopy with the immediate availability of fiberoptic intubation on first pass. The malleable stylet can also be passed through supraglottic airways or used as an independent intubation device. The device is sold by Clarus Medical: http://clarus-medical.com/airway/products/levitan. Dr. Levitan has assisted in the prototype testing and development of numerous other intubation devices and supraglottic airways. After learning of low flow nasal oxygen to prolong safe apnea in elective anesthesia, Dr. Levitan began applying this technique in emergency situations using higher flow rates. In most patients, running oxygen through the nasal cavity and into the upper airway prevents desaturation, and it also helps tremendously in pre-oxygenation. He coined the term, NO DESAT—Nasal Oxygen During Efforts Securing A Tube. This simple technique–leaving nasal cannula running during intubation attempts–is becoming widely adopted by ED physicians, ICU’s, and EMS agencies. He initially wrote of this technique in EP Monthly in 2011 (epmonthly.com/features/current-features/no-desat-/), and then co-authored a paper with Dr. Scott Weingart (EMCRIT.org) that highlighted the technique. It has been one of the most downloaded articles in emergency medicine since its publication [Weingart SD, Levitan RM. Preoxygenation and Prevention of Desaturation During Emergency Airway Management Ann Emerg Med. 2012 Mar;59(3):165-75. ].